If you plan to camp (like we did), bring all camping necessities. Make sure to bring two extra outfits for your nugget per day that you'll be there. Our favorite nugget accessory on this trip was out KidCo PeaPod travel bed and, of course, our Osprey Poco AG child carrier. Packed snacks are a must. To secure a campsite at Cypress Lake Campground (campground with trails connecting to Indian Head and The Grotto on Lake Huron), you must book in January as soon as registration opens on the Parks Canada website. July and August are its busiest season, along with long weekends. I suggest going in June if you want the opportunity to explore with less people on the beaches and trails. If you visit during the week, it's a little less busy than it is on the weekends. Which means faster service, fewer line-ups and waiting - key incentives when traveling with a 16-month-old, as we did. I highly recommend visiting this area in June, as July and August are extremely busy. The most expensive part of this mini adventure was the ferry we took to Flowerpot Island. You can save money by doing this activity during the week (C$4 less per person). The Cypress Lake Trail is a hiking trail with some boardwalk areas. If you are using a stroller, a travel stroller with larger wheels or a jogging stroller is necessary. The best kid-carrying option is a hiking carrier, a sling for smaller babes or BabyBjörn-type carrier. The trails are divided by difficulty. The easiest and fastest trail to Indian Head Cove/The Grotto is Cypress Lake Trail to Georgian Bay Trail. It's less than a 20-minute hike. The path is very wide and not too steep, just a slight incline. There are views of the lakes along the way. When you arrive in Indian Head Cove, you will want to park your stroller and carry your nugget down the trail to the beach. If you've got your children in a carrier, check out the sights over looking Lake Huron on your way in. It's absolutely breath-taking. There are several trails along the Georgian Bay coast that are also a must-see if you have a carrier. DIRECTIONS There are connecting trails all throughout the Cypress Lake Campground that leading to the cliffs/The Grotto/Indian Head Cove. If you are not staying at the campground and are coming into the National Park for the day or half the day, Cypress Lake Road is located off Highway 6. Inside the campground/National Park are several options for parking, but choose the parking #1, which is closest to the head of trails. TIP There are no lifeguards and the water is too cold for swimming in June. It was still quite cold in July and August, but our little nugget was in heaven, playing with the rocks and dipping his feet into the water. A good water shoe or durable sandal is a must for children, while proper shoes for hiking or walking are best for parents. The Fish & Chip Place is located in Tobermory, a beautiful town with many activities and shops. I had the best fish tacos I've ever had (and I've eaten plenty of fish tacos). The restaurant is very family-friendly with standard prices. They provided a kids menu with crayons, as well as a high chair. The kids menu is pretty average - our nugget was still on a bottle and was picky with solids, so we brought snacks and meals for him. There is plenty of outdoor seating, including some protected by an awning. The outdoor seating has a beautiful view of the harbor. DIRECTIONS Coming out of the campground/National Park, follow Cypress Lake Road to Highway 6 - go right onto Highway 6. Tobermory is located at the end of Highway 6 - you can't miss it! The Fish & Chip Place is located on Bay Street. Take a right on Head Street, left on Brock Street followed by a left onto Bay Street. There is parking on Brock and Bay streets. TIP Bring your hiking gear so you can go straight to the ferry location after lunch. 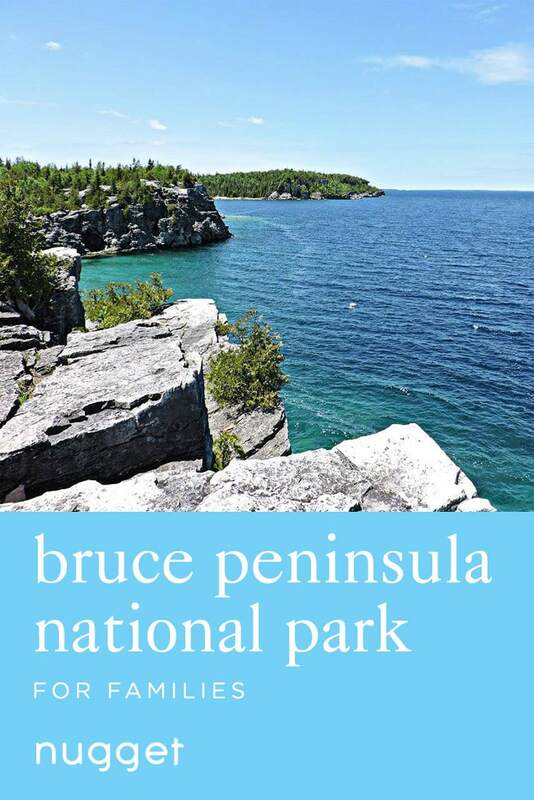 Bruce Anchor Cruises provides ferries to Flowerpot Island, as well as a few other locations on the bay. Of the several options for ferry tours, we took the glass-bottom boat tour that shows shipwrecks in the bay, followed by the trip to Flowerpot Island. The ferries are very safe, the staff is extremely friendly and dogs are allowed aboard. Once you arrive to the Island, you are given the option to stay for one or several hours. There are many natural wonders here. We had time to check out the “Flowerpot” rock formations and caves. The trails are not stroller-friendly and it's best to have a hiking carrier for nuggets under 4. DIRECTIONS From the Fish & Chip Place, follow Bay Street back to Highway 6 and then turn right. The ferry terminal is located at the end before the highway turns to the right leading to its end. TIP The ferry was the most expensive component to our mini adventure but well worth the cost. It is cheaper on weekdays. Bring lots of water! Make sure to have another set of clothes for your nugget. Bring snacks. If you plan to hike the entire island, bring appropriate footwear and sweaters. WE LOVEDI loved how close we stayed to the trailheads and the fact that we were staying in the National Park next to a beautiful lake. TIPI suggest staying during the week, as it is busy on the weekends. Campsite #17 is close to the trails, close to the water and is considered one of the more private sites.